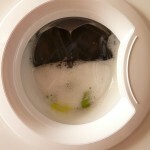 > Blog > Articles > What Can Go Wrong with Washing Machines? Does your washer rock? That’s an easy fix. You just have to adjust its legs till it’s leveled. This won’t only spare you the headache of the noisy washing machine rock dance, but will also keep its cabinet from getting damaged. And it won’t damage your floor. Why this problem occurs? Because the legs loosen up while the washer spins in Ferrari-style speeds. But don’t get too excited! Not all washer repair tasks are such easy fixes. This is perhaps the only thing you can do alone to make sure the washing machine spins without walking from one side of the laundry room to the next. These are the most common washer problems. And you are most likely wondering why such problems occur! In order to answer that, let us take a step back. The philosophy behind the washer mechanism is simple. The appliance fills with water and agitates to stir clothing. It drains the water before it refills to agitate some more and finally rinse clothes and drain all water. In between, hot and cold water mixes up, detergent is drawn from the tray, temperatures are adjusted, dirt is trapped, and water comes in and out. And although all that sounds so easy, it takes the good cooperation of several parts to make the process right. The valves allow water to come and go, the thermostat makes sure the temperatures are right, the drums rotate, the pump removes water and above all stands the programmer coordinating the process. So you can imagine that any damage will interrupt the cycle. And it’s definitely not easy to repair washing machine parts. So let’s go back to our washer problems. When the washer doesn’t spin, for example, it might be due to a damaged lid switch or belt drive. If it doesn’t drain, there might be a problem with the pump, belt drive or a drain hose. If there is soap on your clothes, one of the valves might be defective. But this problem is also caused when you overload the washer or use too much soap. What makes a washing machine repair service difficult is that there are more answers to one question. When you ask: why is my washer not agitating? It might be due to a bad lid switch, drive spindle, agitator assembly, timer contact and other parts! Washers are designed to do a specific job. But their mechanism consists of many components and although the process is not complex, there is so much going on in the appliance when it is in operation that anything can go wrong. It only takes one faulty part to bring the “titan” in your laundry room down. So don’t wonder why washers give you a hard time. Simply call a washing machine technician!